It’s finally time to say goodbye to Carl. From the opening montage to the quiet pop of a bullet as Rick and Michonne stood sobbing outside, the episode handled the death of Rick’s eldest extremely well – even if some thought it dragged on for a little too long. If you were humming along to the song at the beginning of the episode, I don’t blame you – it’s a good’un. Bright Eyes’ At the Bottom of Everything (which, as luck would have it, tells the story of a man coming to terms with his life as he faces imminent death) is a perfectly bleak choice for a show that only uses non-diegetic music when it really has to. Everyone seems to agree with the choice too. Ah, Morgan. Our favourite pacifist-turned-gut-ripper was at it again this week. His final kill may have been stolen from him by one of The Kingdom’s youngest citizens (are we seeing another Carl in the making? ), but it’s clear that Morgan hasn’t been right for some time. In all honestly, though, I’d happily watch Morgan turn into a horror movie slasher more often. Those scenes give me chills. It wasn’t a flashforward. It wasn’t a hallucination. It was all Carl’s doing. It seemed to stem from his hopes for a new world once he’s gone. It all seems very optimistic – heck, Negan is there to embrace Judith which opens up a whole ‘nother can of worms – but the message that Carl’s optimism never died will surely stay with Rick (and us) for at least the next 40 seasons. Not everyone was happy with the mid-season premiere. Pacing seems to be the main issue but, having said that, it definitely stuck the landing. We’ve got the main talking point from the first half of the season out of the way quickly without lingering on it; it’ll be fascinating to see where the show goes from here. 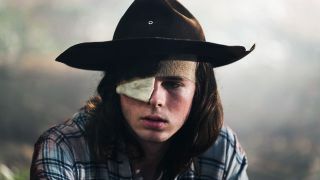 It's time to get over Carl, here's still more to come: 5 questions posed by the Walking Dead season 8 mid-season trailer should get you out of your stupor.